Stagecoach, which partners Virgin Group in running Virgin Trains, has been banned from three franchise competitions due to a row over pensions. The decision by the Department for Transport (DfT) means the operator’s bid to run trains after its current deal expires in March 2020 has been barred. Virgin Group boss Sir Richard Branson wrote in a blog post that he was “devastated” by the Government’s decision, claiming Virgin Trains is “one of the best train companies in the UK, if not the world”. Latest research by Transport Focus found that the operator has a 90 per cent customer satisfaction rating, which is the highest for all long-distance franchises. Sir Richard wrote: “Running the railway comes with many challenges and the West Coast Main Line was struggling when we took it over, but we were determined to turn it around. The winning bidder for the West Coast Partnership franchise – due to be awarded in June – will be responsible for services on both the West Coast Main Line from March 2020, and designing and running the initial HS2 high-speed services from 2026. Stagecoach said it was informed by the DfT that it has been banned from the East Midlands, South Eastern and West Coast Partnership franchise competitions after submitting non-compliant bids “principally in respect of pensions risk”. The firm’s chief executive Martin Griffiths said: “We are extremely concerned at both the DfT’s decision and its timing. The Department has had full knowledge of these bids for a lengthy period and we are seeking an urgent meeting to discuss our significant concerns. Dutch state-owned company Abellio will take over the East Midlands franchise from Stagecoach, which has its headquarters in Perth, on 18 August. 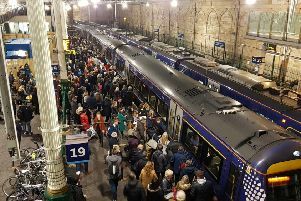 Passengers will benefit from new trains with more peak-time seats, reduced journey times and more than £17 million of station improvements, the DfT said. Analysis has revealed that 60 per cent of rail journeys will be on trains operated by overseas companies or governments once Abellio begins running the route, which stretches from London St Pancras International to Northamptonshire, the East Midlands, Lincolnshire, Staffordshire and South Yorkshire. Abellio was handed an eight-year contract despite the head of a Government-commissioned review into Britain’s railways recently declaring that franchising “cannot continue” in its current form.